In a menswear market flooded with dierent takes on athleisure, it’s refreshing to see the trend reinterpreted into something as clever and straight-forward as Véronique Nichanian’s spring capsule collection of calfskin bags and accessories for Hermès. 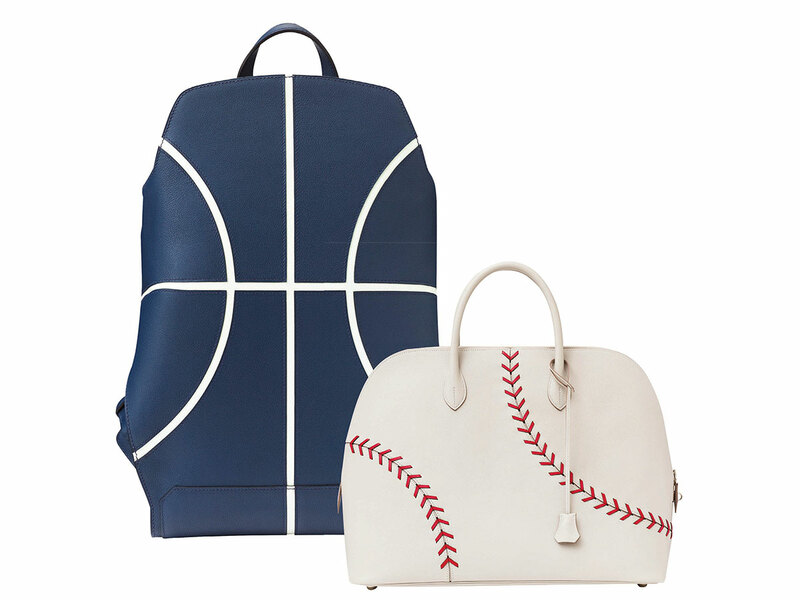 From left: Cityback basketball leather backpack, $8,700, and Bolide 1923 baseball leather bag, $13,600, both at Hermès, Boylston Street. The seven-piece oering, which consists of a backpack, a holdall bag, a purse pouch and key holders, takes iconic sports graphics—such as basketball court lines and the pattern play of a soccer ball—to new heights. The result is some of menswear’s most intriguing must-have pieces in recent memory. The standout: an off-white version of the maison’s classic Bolide Voyage holdall, with intricate, curved redstitched lines of a baseball and crafted in the most luxurious of leathers. This cool combination fuses the worlds of high fashion with recreation, proving these pieces aren’t simply a celebration of sports, but of style as well.